Things really are different at the Emirates this season. After his brace against Burnley on Saturday, Pierre-Emerick Aubameyang will be top of the Premier League scoring charts on Christmas day. Since Robin van Persie picked up his Golden Boot in 2012 and moved up the M1 to Manchester, Arsenal involvement in the race to be top scorer has been rare. By this stage of 2016/17 Alexis Sánchez had 12 goals, and he finished with an impressive 24, but in a particularly high scoring season, he was only able to finish third overall. That is the only time in the last six full seasons that an Arsenal player has found the net more than 16 times in a league campaign. For Aubameyang, however, such a position is not a new feeling. This is a player who, in his last full season in Germany, not only won the cannon award for top scorer in a closely fought race with Robert Lewandowski, but also scored more goals in a single Bundesliga season than anyone since the 1977. Last season he played for two struggling teams whose managers didn't last past May, and his campaign was impacted by the January transfer, but he still managed to score 23 league goals. 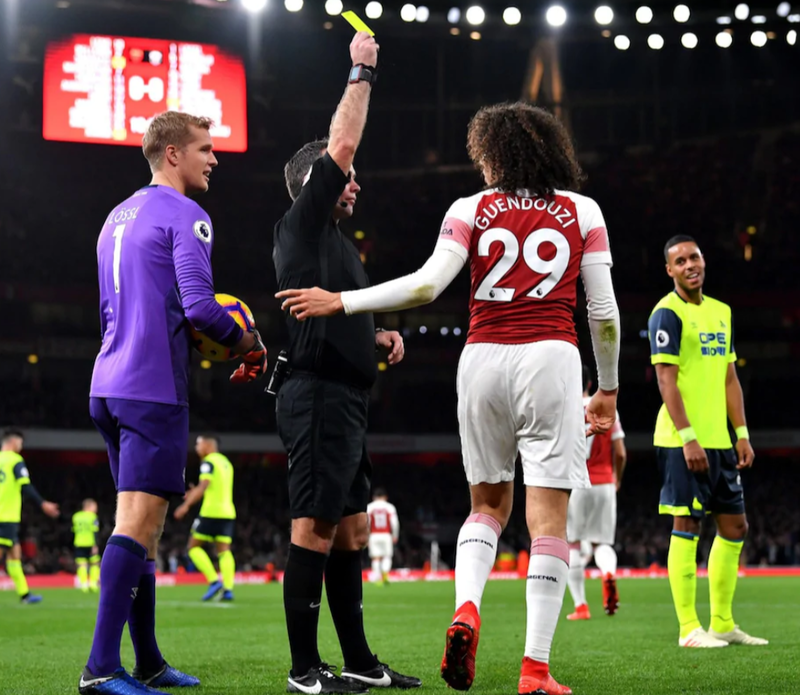 Despite this, however, it actually feels like Aubameyang is somehow underrated, or overlooked, when it comes to the Premier League’s standout players. Even amongst Arsenal fans there sometimes doesn’t seem to be a full recognition of the fact Arsenal have one of world football’s most prolific goal scorers, who isn’t injury prone, a luxury they’ve arguably only had for a single season since Thierry Henry left the club. 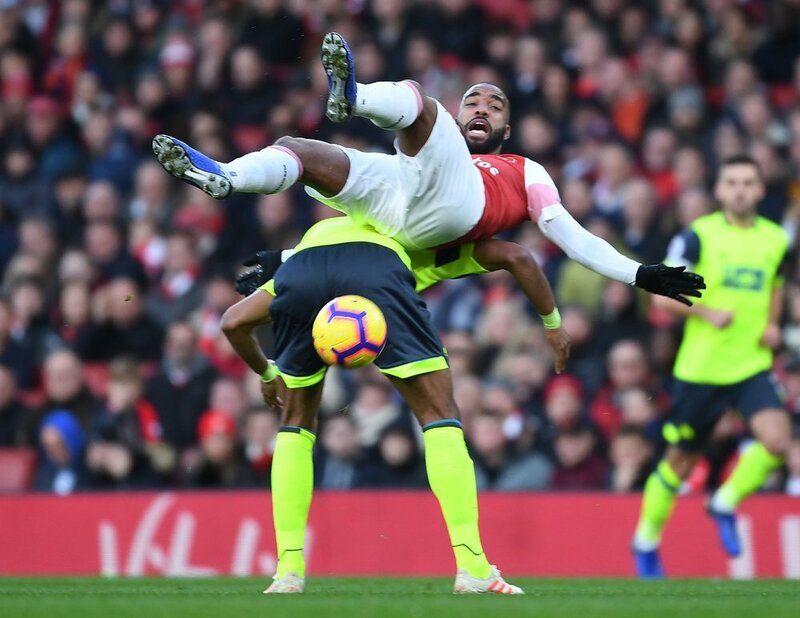 I think Aubameyang ins't helped by his style of play in this regard. His lack of involvement in general play means he rarely stands out in matches, even when he scores. His repertoire of eye-catching goals has actually been better this season than in his time at Borussia Dortmund, but a significant proportion of his goals still look relatively simple and aren't very memorable. It’s not an exaggeration to say that many of his goal celebrations are more spectacular than the goals themselves. Arsenal more than most clubs have come to appreciate strikers for more than just scoring. Thierry Henry was arguably responsible for helping to change how strikers are viewed in England, thanks to his selflessness in setting up others and amazing all-round dribbling and passing skills. Like Henry, Robin van Persie evolved from a wide man or support striker to a genuine centre forward, while maintaining his top class technique and link up skills. When he became only the second Arsenal striker of the last ten years to score 20 league goals, Alexis Sánchez was still near the top of the league in chances created, through balls and dribbles. Even Olivier Giroud was defended for not being the most prolific striker around because of his perceived ability to bring others into play. This combines to mean that on a match to match basis, Aubameyang rarely has single performances that are considered particularly impressive. He has four games this season where he scored a brace, yet hasn’t won a man of the match award in the Premier League this term. 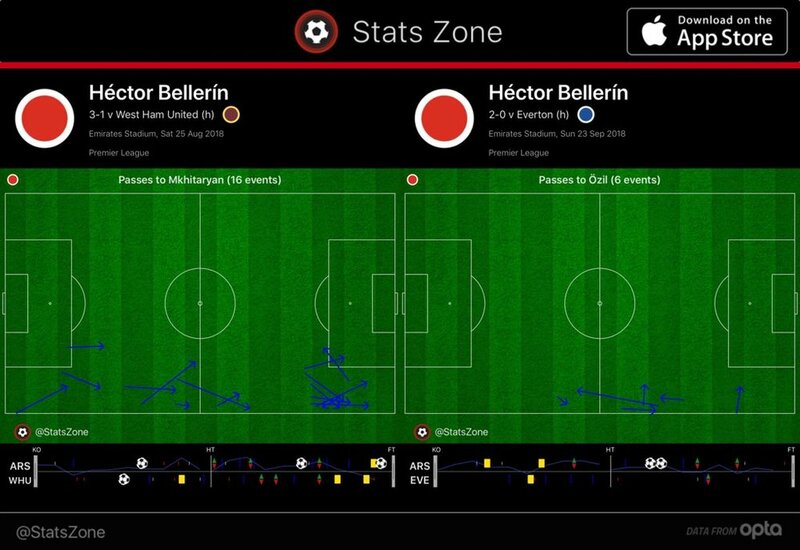 Sure, the goals at Fulham came when the contest had already been decided, but his goals in the other three were decisive, yet the general consensus afterwards was that there had been better performers. There’s nothing inherently wrong with this. People’s idea of a man of the match display is a complete performance rather than one or two decisive moments. It does, however, show how such a player can go a bit unnoticed. Consistency can sometimes be overlooked at the hands of the spectacular. Describing what it is that Aubameyang does so well can be both straightforward and quite difficult. His goals speak for themself, but attribute wise it’s harder to explain what makes him so good. He’s not a link up striker and he’s not very good at creating his own shots off the dribble. People often describe poachers like him as clinical finishers, but this hasn't been the case for most of his career. In has last six months at Dortmund he scored just ten goals from almost 14 expected goals in the Bundesliga. 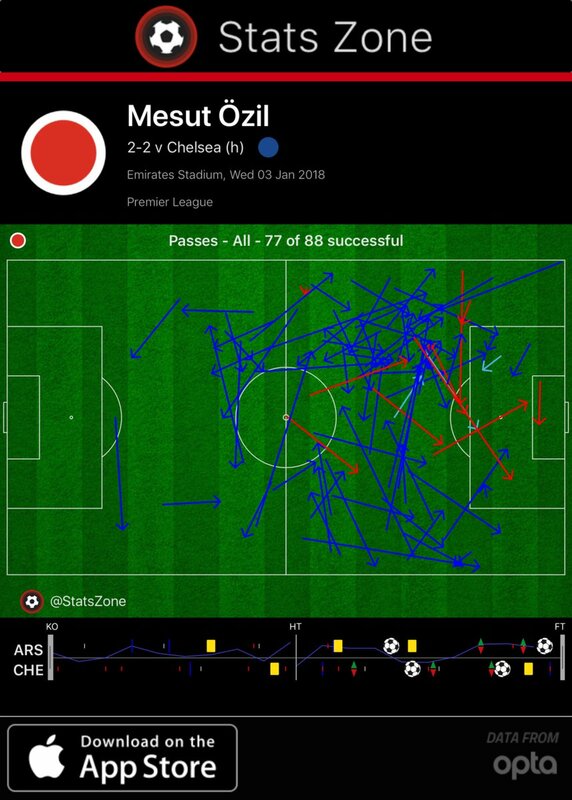 This season he’s been efficient in front of goal but has still missed some big chances, like in the 1-1 draw against Wolves or the 2-2 at Old Trafford. His strength is essentially getting on the end of chances. At Dortmund he got on the end of chances more than almost any other player in the world and the goals naturally followed. He’s a similar player to Edinson Cavani in many ways. He can have misses that look sloppy, but his movement allows him to keep churning out good chances, and his fitness and durability allow him to keep getting on the park and produce big numbers over a season. Despite him sitting at the top of the Premier League scoring charts, it's clear Arsenal are yet to fully get the best out of Aubameyang. This could either be viewed as a concern - what happens when he goes on a finishing slump? - or as something to be encouraged by - if he’s top scorer now, what could he do if Arsenal managed to eek out even more from him? His non-penalty expected goals per 90 minutes figure is currently 0.51, 5th highest in the league. But that pales in comparison to his last 30 months in Dortmund, where the figure was 0.9, one of the absolute highest in Europe. His period of elite output in Germany can kind of be broken into two parts. In 15/16 Dortmund were one of the strongest teams in Europe, with a balanced and cohesive midfield and attack able to consistently create all types of chances. Their off ball movement and creativity meant they were regularly able to get in behind opposition defences and all of the front three scored multiple tap ins. After that season key players were sold and injury ruled Marco Reus out for most of Aubameyang's final 18 months in Germany. The team suffered significantly but it only increased their dependence on their star striker. Aubameyang formed a brilliant partnership with 19 year old Ousmane Dembélé. The winger assisted 10 of his 29 non-penalty league goals in 16/17. Dembélé is a player who can assist all types of goals, but his trademark assist that season became the low cross to Aubameyang. 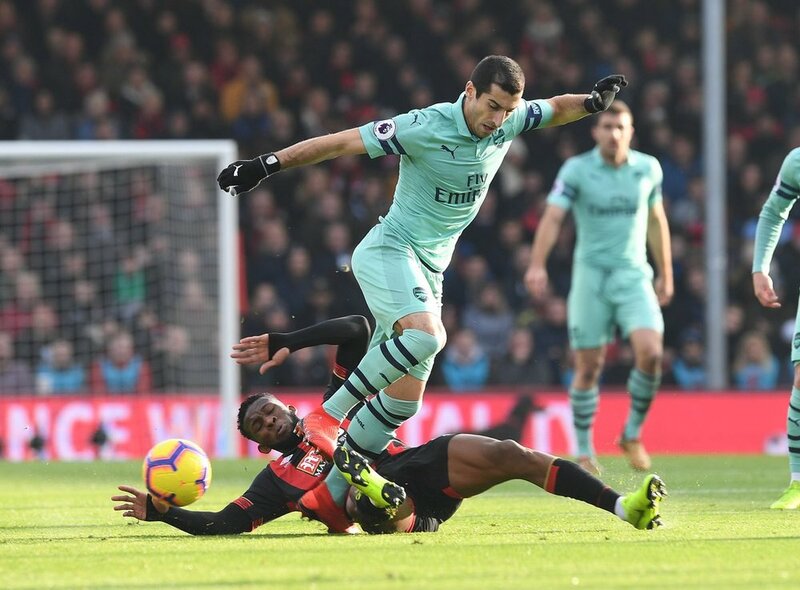 He had the ability to manufacture space on the wing with his speed, dribbling and two footedness and send low curling crosses to Aubameyang in behind the defence (see 1:20, 1:40, 4:00 and 5:30 on the video below). This is one of the most effective ways Aubameyang utilises his pace. When a wide player gets the ball behind, or even just close to inline with the defensive line, they can play the ball behind the defensive line and Aubameyang has the speed to reach what the defenders and most other forwards in the world can’t. The finish is simple but most players don’t have the athleticism to reach the number of balls he does with his slide tackle esque tap in. 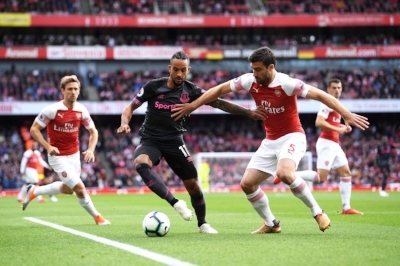 While it’s not a surprise that without genuine wingers, Aubameyang has relied on fullbacks for service, it is perhaps concerning that the other attacking players have been responsible for such a small proportion of the big chances he has got on the end of. 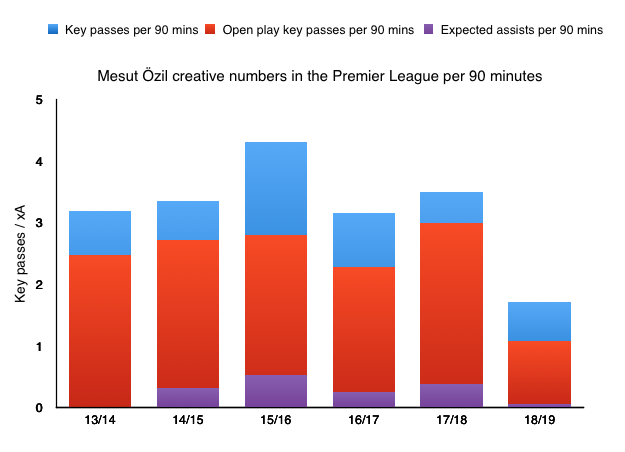 Only Ramsey has been able to set up multiple chances of decent quality for him, and although Ramsey's assist total is inflated, his xA (expected assists) on passes for Aubameyang in the limited number of minutes they’ve played together is fine. I made a graphic showing the chances that have been created for Aubameyang this season and colour coded it by who created the chance. 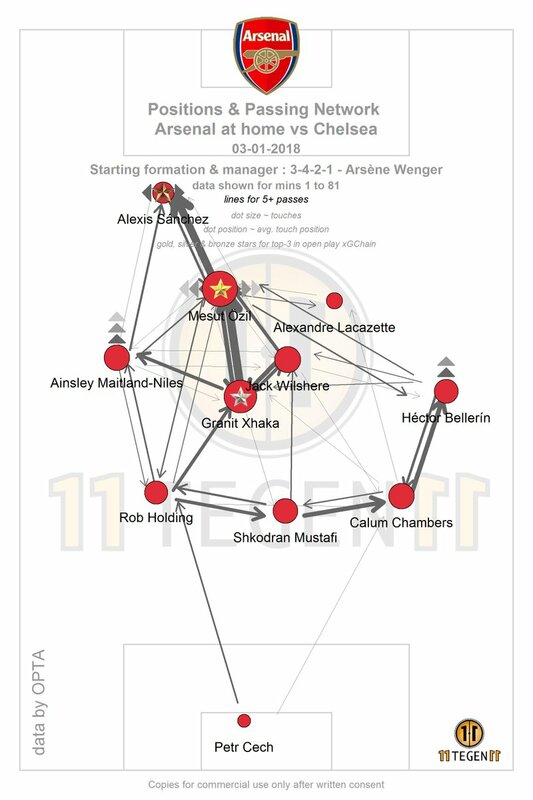 As you can see the majority of chances in the danger zone were created by either Bellerin or Kolasinac. Other than the chance Iwobi created against Chelsea, there's no other openings from the half spaces. 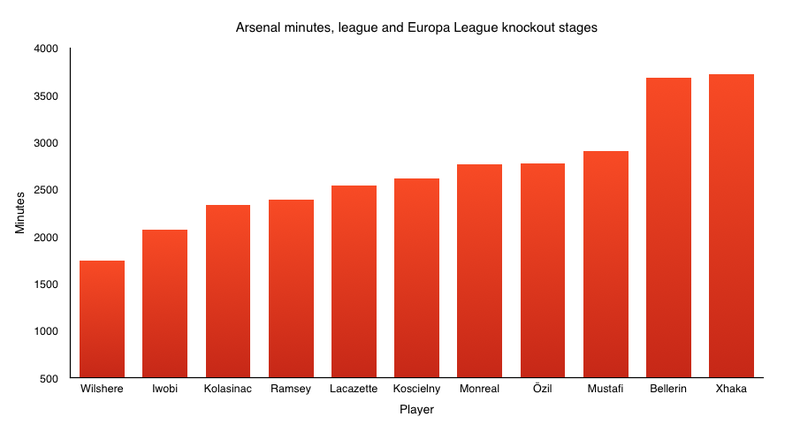 Most concerning is the lack of significant chances created by Özil and Mkhitaryan. 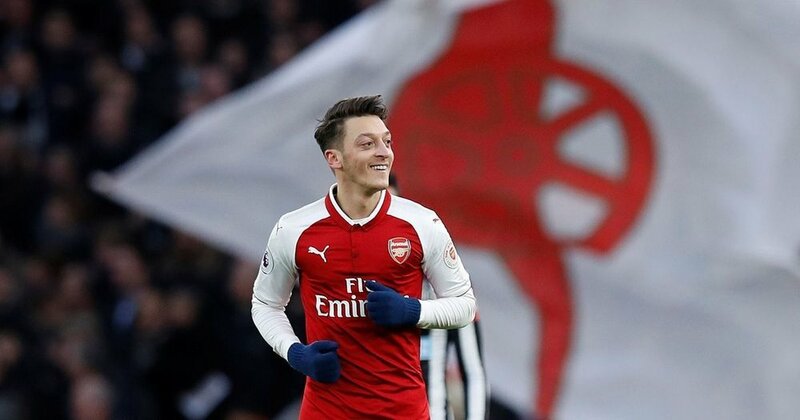 Other than the one assist against Leicester, Özil hasn't been able to find Aubameyang on the end of moves, though he was instrumental in both his first goals against Leicester and Burnley with brilliant pre-assists. 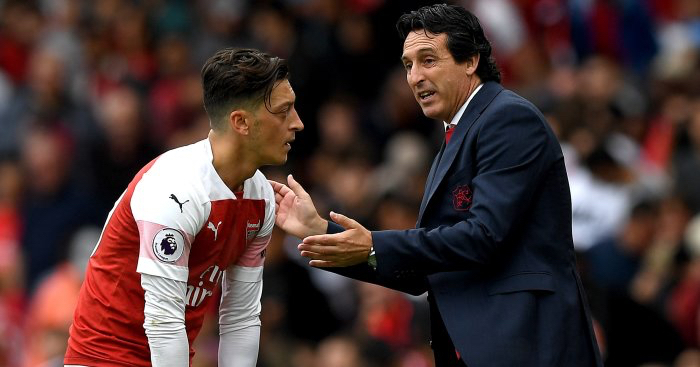 Özil did create some good chances for Aubameyang in the few matches they played together last season, which suggests the problem is more down to the Özil specific issues this season rather than a lack of compatibility between the pair. 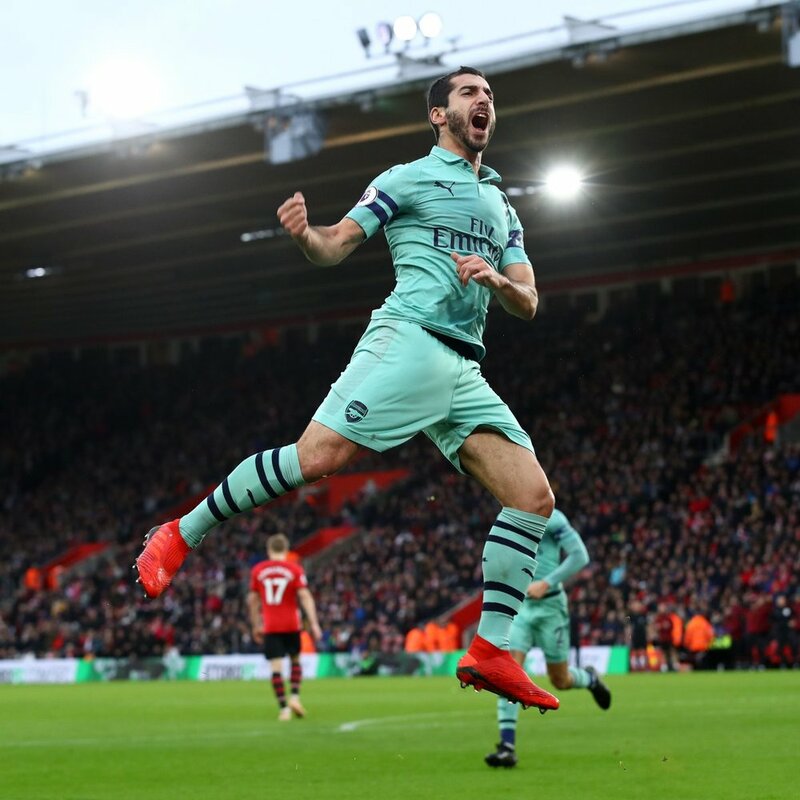 Mkhitaryan enjoyed a fine partnership with Auba in Germany and assisted two of his first three goals for the club, but since then it’s been slim pickings. 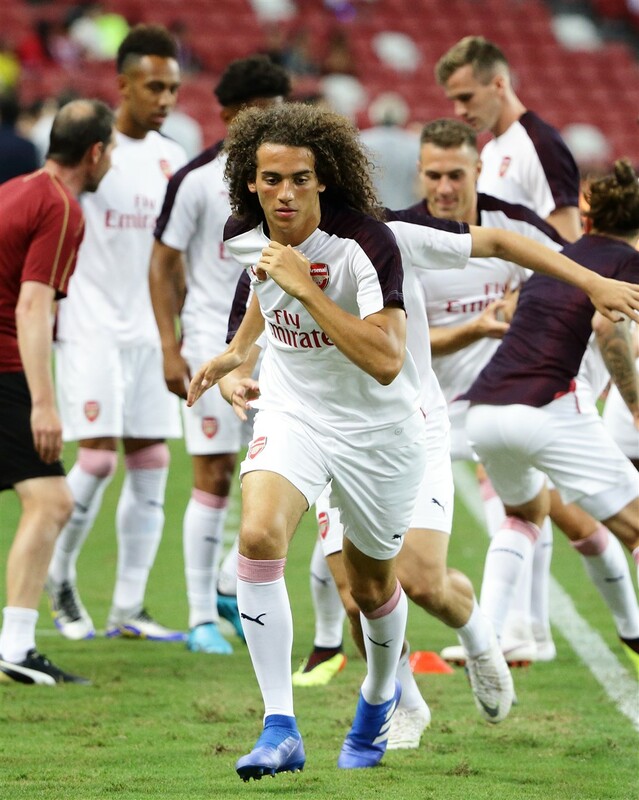 The reality is Arsenal lack a brilliant one v one winger like Leroy Sane who would help get the most out of Aubameyang, and that has to be the focus on the attacking front in future transfer windows. But that doesn't mean the current attacking midfielders can't contribute more. They have the capabilities to be doing more on the creative side, whether it be playing incisive through balls or getting into the half spaces and finding accurate cutbacks. 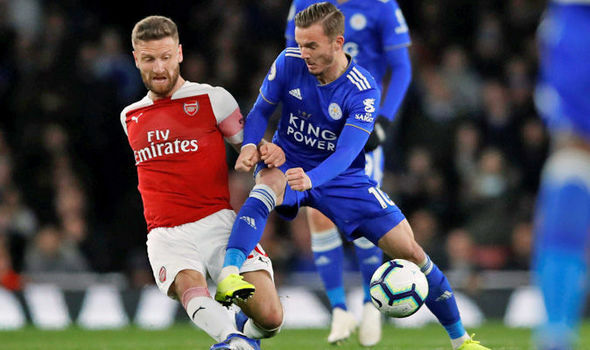 If Aubameyang is to get the goals needed for the Golden Boot and, much more importantly, if Arsenal are to get the goals needed to move back into the top four, both player and club will be hoping for, and relying on, getting more from their chief playmakers. Oscar Wood is a special contributor. Follow him on twitter @reunewal. "The Library" is the place to find great writing from members of the pod's first-team and big-name signings brought in at great expense to add much needed quality. If you'd like to contribute, be sure to get in touch.